I used to really struggle in my homeschool. Trying to get a good routine going, making curriculum choices in the seemingly endless sea of options, and dealing with learning and logistics issues… it was enough to make my head spin! At some point the lightbulb came on: I needed to pray for and over my homeschool with just as much intentionality as any other important area of my life! I wanted a prayerful homeschool. Is the same true for you? What kind of difference would it make in your homeschool year if you spent it more fully submitted to the Lord in prayer? What impact would it have on your family to include prayer more regularly throughout your homeschool day? We know that praying more, trusting God more, and leaning on Him more for all our needs is always sure to be a blessing. Cultivating a prayerful homeschool may be the best thing you do for your family this year! When we don’t pray regularly for/over our homeschool, we’re missing out on peace, guidance, and blessing. When I made the choice to begin praying more for my homeschooling, I received greater clarity and smoother days! Why? Because the big picture of our homeschool matters to God. The details matter, too. He has entrusted us with the teaching and training of these precious children He has created! When we ask for wisdom and guidance, we will receive it. – Look forward and begin thinking about planning. No matter where you are in your homeschool year, it’s always a good time to start praying more! Like anyone, I have ups and downs with my prayer habits, so I occasionally need a refresher. I need that right now! Will you join me? 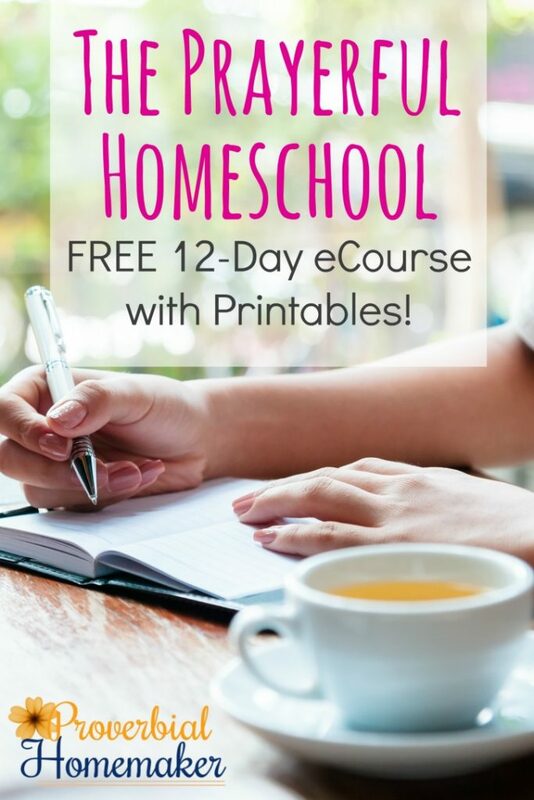 Prayerful Homeschool 12-Day eCourse with Printables! Join our Prayerful Homeschool 12-day course! You’ll get free printables, tips, and encouragement! Sign up for the eCourse! 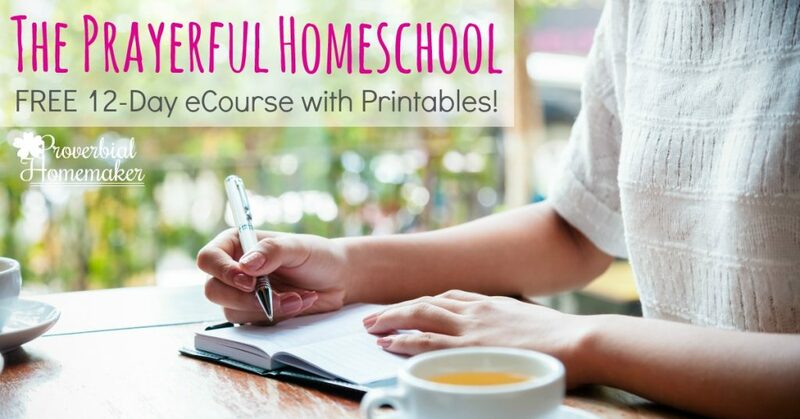 Signing up for the ecourse will subscribe you to Proverbial Homemaker emails if you aren't already. You'll get the first ecourse email on May 18. Enjoy! Fantastic! Watch your inbox for the first email! I hope you enjoy the eCourse. This sounds awesome!! I need to pray for my children and our schooling More. I have been praying for myself a lot, I have so many faults! Is this still available for others? I signed up earlier and enjoyed working through some of the course (still not finished, yikes! ), but I think it would be helpful for a friend of mine and want to know how to share it with her. Thanks! My question is, is this course going to start on may 18, 2018? The course is available year-round now! The course is available year-round now! I changed the old wording. Sorry for the confusion!